The GiPro is a Gear Position Indicator with a modern processor and sophisticated firmware, it offers faster and more reliable readings than comparative products. There are no buttons and no programming wire, just go through the gears and you're done. The GiPro features a highly efficient display available in Bright Red, Cool Blue, White, Green or Yellow. It features a simple and clear front face which goes along nicely with the factory instrument cluster. The product is rugged, 100% weatherproof and comes with 2-year replacement warranty. "I would just like to thank you for a prompt delivery. It was easy to install and looks very good, thank you." 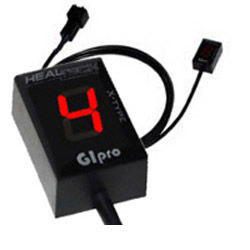 "Just for general info, it's very easy to fit the GiPro DS gear indicator from Healtech to a Tiger 1050... I'm quite happy with it, saves me going the highway in 4th." "Both impressed with the speed of delivery and the quality / ease of fitting of the product... Now looking forward to a Summer of knowing which gear I'm in." "I think I have experience with the main gear indicators so was going to do a review. But honestly there is no point, The Healtec GI-Pro X-Type is by far the most superior in everyway. The GI-Pro is Half the Size, 10x as fast, easier to install and has better instructions. I have the Acumen DG8 on my TDM and I have the GI Pro on my Speed Four, The DiGi is currently sitting in my bin. If I haven't sold it too you yet, it also comes with a programmable speed warning, shift light AND a 2 year warranty, which neither of the others do! Gi-Pro gets the Chris-Red Seal of Approval." "Yikes! This bad boy has turned my modest R3T into a bad girl! It feels as if the first three gears have opened up and allow considerably more power. I wasn't displeased with my stock Touring, but this adds a whole new dimension... my experience is all positive so far. I'm a fan, best $$$ I've spend on mods and accessories. Now, I must concentrate on keeping the front wheel on the ground." "I just came in from taking it out for a little spin and I can't believe the difference. The throttle response is snappier and I can feel a big difference in first gear torque. How I can tell is I have never had the front tire that high in the air before and I wasn't even trying. I just let out on the clutch and then throttled her hard. The front end just came up. When the tire came down I was looking for second gear and now I can hear the rear tire chirping in 2nd and 3rd gear. Oh and it is pretty cool to have a gear indicator also. ... I think it was the best 160 bucks I spent on the bike so far. " "I love the thing, I'm probably its biggest cheerleader. It's worth the price alone just to stop trying to shift into 6th all the time, having 1st, 2nd and 3rd gear come alive is a bonus. Eliminating the speed limiter was just another little benefit too." The GiPro-DS reads the gear position information directly from the ECU via the manufacturer's diagnostic port (where fitted), which makes it faster and more reliable than other gear indicators. There are no buttons, no programming wires. The unit is fully automatic. In most cases there's no need to cut and splice wires, no need to access several connectors and only ONE plug to connect - it couldn't be simpler! 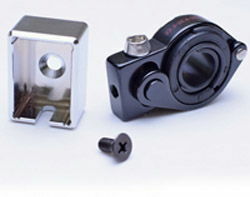 The GiPro-X connects to the speed sensor, and one or two simple wire taps to the loom/ECU may be required, installation is made as simple as possible for each individual bike. A Programmable Shift Light function as well as High Speed Warning feature is included. 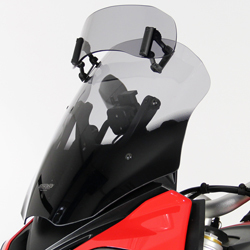 For all Triumphs without electrically driven speedos as standard (but which do have an electrically/electronically driven Tacho/Rev-counter) the GiPro Wheel Speed Sensor (WSS-Type) comes with a magnetic pickup convertor included to provide the electrical pulse required to activate your gear indicator. Please note the WSS units are universal and not model specific, but installation has been made as simple as possible. This combo unit includes a built-in Advanced Timing Retard Eliminator which improves acceleration and throttle response in lower gears. This feature can be turned on and off at the touch of a button to comply with local regulations. The Auto Brightness Controller ensures that display brightness is always optimal (the sensitivity level can be fine tuned if desired). *Please note that on some earlier bikes, or ABS equipped late bikes, it may not be possible to have a plug-in unit. in which case a universal kit will be supplied with fitting instructions. If you have any questions, please contact us prior to ordering. !quote, electronics, naked, faired, street triple r, 95, 96, 97, 98, ,99, 00, 01 ,02, 03, 04, 05, 06, 07, 08, 09, 10, 11, 12, 13, 14, 15, 16, 17, 18, 19, 20, 1995, 1996, 1997, 1998, 1999, 2000, 2001, 2002, 2003, 2004, 2005, 2006, 2007, 2008, 2009, 2010, 2011, 2012, 2013, 2014, 2015, 2016, 2017, 2018, 2019, 2020! Many thanks will recommend you. Husband is delighted with his GIpro ATRE gear indicator for his TL1000R HPS delivered quickly and the item was in perfect condition due to great packaging. Ordered a digital gear indicator from Bike HPS which arrived less than 24 hours later. Very simple to fit, it took me longer to remove the Triumphs plastics to get to the wiring than it did to fit & calibrate the indicator. Would highly recommend this product & Bike HPS. Very pleased with how this worked. So very easy to install and set up. Also very responsive and easy to see in bright sunlight! Used a Positap on switch fuse wire that is for bike alarm. 30 second hook up. Hard part is figuring out how you want to route under tank to keep from pinching any wire.